Amopé Canada wraps up the ultimate DIY spa experience! Believe it or not, the holidays are right around the corner and it’s time to start planning your annual holiday gotta-give gifts. Amopé Canada understands that finding the perfect present for the ladies in your life can sometimes be a challenge. To alleviate some of your gift-giving stress, Amopé suggests you pamper your loved ones with its new, limited-edition Pedicure Gift Set. There’s no better occasion to set aside time for self-pampering than during the holidays! From standing on our feet for endless hours at holiday parties, to trekking through the cold and snowy, winter months, our feet need extra love and attention in the winter, and throughout the year. Whether you’re shopping for your mother, hardworking sister, bighearted daughter or your brother’s oh-so-supportive wife – spoil her with the gift she truly deserves – a spa-like experience and silky-soft feet, all in the comfort of her own home. The Amopé Pedicure Gift Set includes everything needed for a purely blissful, at-home, professional-style experience. The Amopé Electronic Foot File with Diamond Crystals is the ultimate relaxation device to help your loved one put her best foot forward in the year ahead. The easy-to-use foot file swiftly removes unwanted skin for beautiful, smooth feet. The gift set also includes easy-to-change refills to keep her pedi perfect all year long! Valued at $60, the Amope Pedicure Gift Set is specially priced for the holidays at only $39.97 – $44.99 and when you buy for 2 special ladies in your life, the on-pack coupon lets you save $10! The Amopé Pedicure Gift Set can be found at major retailers across Canada including Walmart, Shoppers Drug Mart and Amazon. Amopé is a complete line of foot and nail care products designed to inspire and help women look and feel confident with every step. The Amopé Electronic Foot File is the #1 electronic foot file brand in Canada, with a new and improved file featuring diamond crystals. 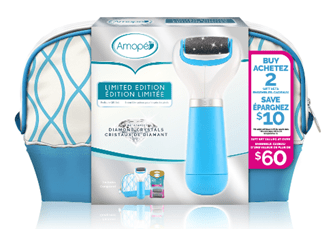 The complete Amopé product line is available at major Canadian retailers including Walmart, Shoppers Drug Mart, and Amazon. For more information visit amope.ca. I have my Amopé Electronic Foot File with Diamond Crystals™ and love it. I have a horrible time with dry cracking feet and with my Amopé Electronic Foot File with Diamond Crystals™ my feet are smooth and spectacular. The Amopé Electronic Foot File with Diamond Crystals™ is easy and convenient to use. I find it only takes minutes here and there or as often as you wish to ensure that your feet stay smooth and crack free. Best of all, my Amopé Electronic Foot File with Diamond Crystals™ means that I can keep my feet feeling spectacular all year long without the costs associated with going for routine pedicures. 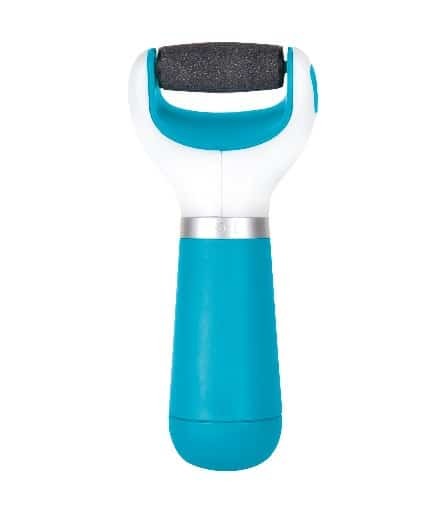 When I use the Amopé Electronic Foot File with Diamond Crystals™, I like to sit on the side of my tub and file all that horrible, dry skin away. After, I have a nice refreshing shower and voila, pedi-perfect feet. I have a couple of trouble zones on my feet that like to crack and dry out, and I tend to focus more on these trouble areas. Giving these trouble areas just a few minutes with my Amopé Electronic Foot File with Diamond Crystals™ ensure my trouble zones stay under control. My biggest recommendation is to not try and fix the entire dry and cracked zones in one sitting. You want your feet soft, comfortable, and beautiful. Make your time with your Amopé Electronic Foot File with Diamond Crystals™ something enjoyable, pampering, and your time. Do just a little bit on a regular routine to get your feet under control while starting out, and then start a maintenance schedule that works for you to keep all the silky softness you have realized. Electronic foot filing is one of my favorite self-care things to do. I hate my feet being dry and cracked. It feels spectacular to have the pure softness to walk on. Looking for that special something to get your loved one this Christmas so that they can pamper themselves all year long, then I recommend that you check out the Amopé Electronic Foot File with Diamond Crystals™.